Empathy is an undervalued skill in marketing. It’s hard to empathize with what customers are experiencing from an office or conference room. With today’s instant feedback and review culture, the theory of customer centricity is putting pressure on organizations to deliver positive experiences and for marketers to better understand customers. Understanding customers’ needs, and the modes in which they attempt to satisfy those needs, has always been the goal of marketers. Day-to-day tactical pressure on today’s marketers can sometimes distract from that focus. 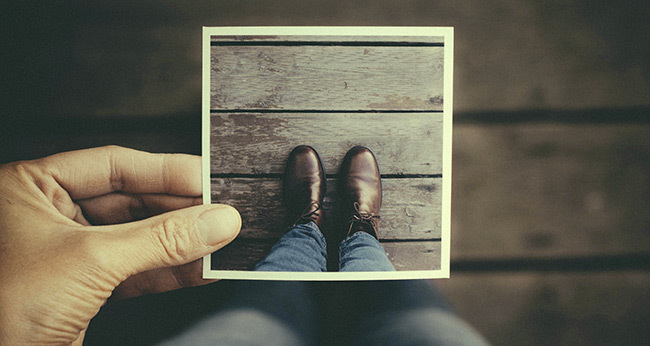 The adage is “Don’t judge a man before you have walked a mile in his shoes.” Here are three exercises you can use to step into your customer’s shoes or at least look at your marketing from their perspective. Seriously, it works. For example, pick out something you offer or promote and have them find it on your website. Have them read the site and ask them their impression. Who is it for? Why? How do they buy it or consume it? Is it easy to purchase or is the call to action clear? Have them follow the call to action and see what they think of the experience. Here’s the hard part: Keep your mouth shut. What you’ll find is you’ll want to help and guide them through it. You’ll want to explain everything and over explain the role of the customer that you’re targeting. You’ll want to scream, “NO! It’s obvious, click there! CLICK. THERE!” This can be painful. It’s hard to look at the materials you’ve worked on meticulously and experience them without bias. Many times you’ll walk away realizing how much creep occurred from your original messaging. Or you’ll realize that some of your content is crusty or just doesn’t make the point you intended. Simply looking at your work with someone who never has experienced it will give you a more customer-centric perspective. An empathy map is an idea organizer tool focused on understanding the mindset of customers. The concept was originated by David Gray founder of XPLANE. Search for “empathy map” online and you’ll see many examples. The idea of an empathy map was originated a whiteboard exercise. 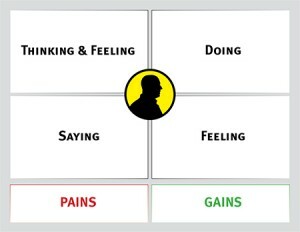 Break the board into four quadrants: thinking, seeing, doing, and feeling. Apply your ideas on sticky notes to the board or just write them into each of the appropriate quadrants. • Thinking and Feeling – What might your customers be thinking? What’s most important to them? • Doing – What actions are customers taking? What behaviors? • Saying – What words are customers using? What is their attitude? • Hearing – Who influences your customers and what are they saying? In addition to the four main quadrants there should be two additional buckets: pain and gain. Pain represents obstacles and anxieties that customers are facing. The pain can be associated not only with the problem they are trying to solve, but also in the process of finding a solution. Gain is what the customer is trying to accomplish. What does success look like and how is it measured? There are many templates available online or you can visit the XPLANE website and sign up for an online version. What better way to understand how your customer makes decisions than consistently asking them? Having these types of ongoing conversations are invaluable. It will alert you to flaws or inconsistencies between perceptions and your marketing messages, as well as give you insight into any changes occurring in the marketplace. Regardless of the tools you use, the act of empathizing with your customers will help you reexamine how you communicate with them. Proctor & Gamble is laser focused on understanding its customers. They come as close to living in the homes of their customers as they can. The insights that they gain from being that close to their customers drives how they make, deliver, and market their products. While you may not be a global multi-billion dollar company, taking the time to step back and step into your customers’ shoes is an invaluable exercise.